The Grand Chamber of the European Court of Justice ruled this morning in Case C-614/14 Ognianov (preliminary ruling by the Sofia City Court), practically implicated in legal illiteracy Bulgarian legislators and magistrates. According to Bulgarian legislation, case law and the position of the prosecutor's office every Bulgarian court, which turns a preliminary ruling to the ECJ in Luxembourg, disavow as biased because it reveals the factual and legal background to the case in question. This leads to automatic removal from the case, whatever the answer to the European Court. Thus Bulgarian law conflicts with European and acquires supremacy over it, although the Constitution of Bulgaria gives priority to ratified international treaties over domestic legislation. Moreover, the Criminal Procedure Code provides for disciplinary action to "biased" judge who dared to ask for anything Court of Justice. Press release in Luxembourg exposes the following picture: In a judgment of November 2012, handed down by a court in Denmark, Mr. Ognianov imposed a total penalty of 15 years imprisonment for robbery with aggravating circumstances and murder. After having served part of a term of imprisonment in Denmark, October 1, 2013 Mr. Ognianov was handed over to Bulgarian authorities to serve the remainder of his sentence in Bulgaria. In that case, the Sofia City Court put the Court of Justice various questions on the interpretation of EU Council Framework Decision of 27 November 2008 on implementing the principle of mutual recognition to judgments in criminal cases. After placing the questions in Case C-554/14 Ognianov (another case which has not yet been scheduled date) Sofia City Prosecutor's Office requested in this case in particular objected to the composition of Sofia City Court hearing the case on the ground that exposure to legal and factual situation in that case, the court has expressed preliminary opinion on factual and legal issues before the case was scheduled for judgment. According to the Bulgarian Penal Code may not participate in the composition of the Court judge who could be considered biased. According to the Supreme Court expressing a court of preliminary opinion on the merits before the delivery of final act is a special case of bias. In the case of bias, the court is obliged to make a gap, which means that firstly he stops to consider the case, secondly, it is distributed again among the other judges in the relevant court and thirdly, the new judicial panel heard the case again. Bulgarian case law is particularly strict in interpreting the condition of "bias". In this regard, it notes in particular that the monitoring of compliance with this condition is performed automatically, and even the slightest indication from the court concerning the facts of the case or their legal qualification automatically lead to grounds for disqualification of the judge . The expression of preliminary opinion by the judge not only leads to his disqualification and repeal the stipulated its final act, but to institute disciplinary proceedings against this judge. According to the Rules of Procedure of the Court of Justice unless referred to the Court for a preliminary ruling reference must contain mandatory elements, some of which are a summary of the subject matter of the dispute and the relevant facts, as established by the national court, or at least a statement of facts underlying issues. In its judgment today, the Court of Justice rule on the compatibility of those provisions of Bulgarian legislation with EU law. According to the ECJ EU law and the Rules of Procedure preclude national rule, as under Bulgarian legislation that obliges the national court must stand in the pending case on the ground that in its order for reference set out the factual and legal context in this case. The Court states that when referring court by the Sofia City Court sets out in its order for reference the factual and legal context, it only meets the requirements set by EU law. In this situation, the fact that the national court presented in its order for reference the relevant factual and legal background meets the requirement for cooperation inherent in the preliminary ruling, and in itself does not breach EU law. In this case, it is apparent that under Bulgarian law, presentation of Bulgarian judge the factual and legal situation in the order for reference taken as expressing preliminary opinion of this judge, leading not only to his disqualification and cancellation of its final act but to institute disciplinary proceedings against him. Therefore, the national provisions in this case could lead to a national judge chose not referred to the Court for a preliminary ruling in order to avoid disqualification, disciplinary sanctions or making unacceptable act of reference. Such a rule affect the powers vested in the national courts, and thus the effectiveness of cooperation between the Court and national courts established by the preliminary ruling. The national court, in this case, the Sofia City Court shall not apply national rule which is accepted to be contrary to European Union law. 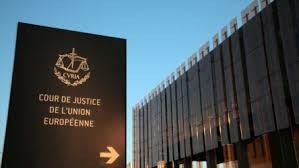 The Court of Justice also decided that EU law must be interpreted as meaning that it requires nor prohibits the judgment being given in a preliminary ruling, the referring court to re-examine the parties and to gather new evidence that could lead it to change factual and legal findings which it made in the order for reference, provided that the full effect of given by the ECJ interpretation of European Union law.